Article looks at 5 innovative color combinations that will be great for the upcoming spring. It emphasizes how a bit of innovation and creativity brings about unique color options. Phew! We are finally approaching the end of a prolonged winter season. On the last day of winter, each of us will breathe a suppressed sigh of relief. What follows next is the sheer joy of the spring season, it is a celebration of life and we being a fashion blog are enthusiastic about how we can enjoy it in a fashion sense. Today’s article looks at how to splash color on our apparels. We are going to look at 5 unique shade combinations that you can really consider for your spring wears. Though this is just a suggested combination to get you started on the right foot, you can use your imagination and get the very best of combinations that will make you look glamorous! The origin of this comes from it being the official shade at the University of Oxford. When combined with the radiance of emerald green what comes up is a unique and refreshing shade. Though not named, try sporting this combination as shown by the models in the pictures. The turquoise shade is a blue to green mineral and when worn with yellow apparels has universal appeal to it. Try wearing these and you are bound to look refreshing this winter. This tone is deeper than powder blue and lighter than royal blue. Try pairing them with Paris greenish shades to bring about a refreshing taste in your apparels. Being bright red with an orange tinged wearing scarlet is an immediate attention given to the wearer. Try pairing this vibrant shade with the royalty of purple. It is a great way to display elegance in bright toned manner. 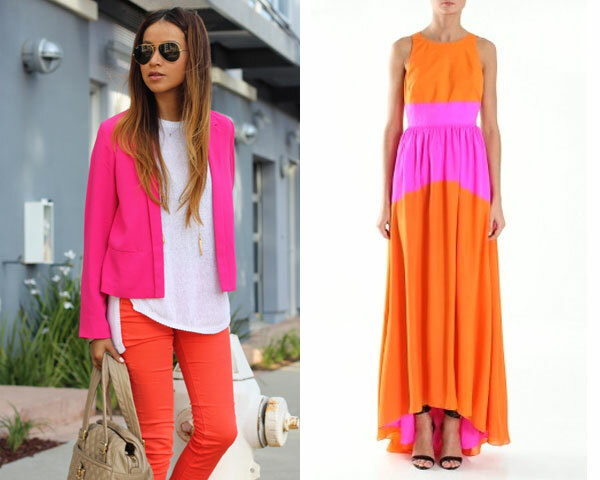 If you are finding red or the scarlet color a bit too bold to wear then try peppering yourself with bright orange. This when layered with a dose of pink will bring about a great change. On a concluding note, hope you have enjoyed the suggested spring combinations. The sky is the limit when it comes to enjoying colors in the spring season. If you have a style of your own, do share it with us. If our editors like it, we will post it on our blog.